Copyright: © 2017 Srivastava A, et al. This is an open-access article distributed under the terms of the Creative Commons Attribution License, which permits unrestricted use, distribution, and reproduction in any medium, provided the original author and source are credited. An autoimmune disease develops when our immune system detects our healthy cells as foreign. As a result, it attacks the healthy cells. Autoimmune disease affects up to 50 million Americans, according to the American Autoimmune Related Diseases Association (AARDA). An autoimmune disease can affect one or many body tissue/organs. It can also cause abnormal organ growth and changes in organ function. This diseased state of the immune system in which it starts damaging specific organs or tissues, is detected by the presence of antinuclear antibodies (ANA) in the blood (serum) of the patients. ANA are particular type of antibodies which are directed against a range of nuclear antigens which have the capability of binding and destroying certain structures within the nucleus of the cells and are detected in the serum of the patients [1,2]. Although lower amounts of these antibodies are seen in normal individuals, an increase in titres are exclusively seen in patients with autoimmune diseases and serve as markers for diagnosis. These antibodies are involved in disease detection and also make a basis for diagnosis and treatment of the disease. Their detection in patient's blood is highly sensitive and specific therefore it is very important to perform the test very well. The first description of ANA test began with the seminal discovery of the lupus erythematosus (LE) cell and its phenomenon by Hargraves (1949). ANA testing is mostly performed for screening of connective tissue diseases such as systemic lupus erythematosus, rheumatoid arthritis, systemic sclerosis, Sjögren syndrome, juvenile idiopathic arthritis, polymyositis, dermatomyositis, phenomenon, esophageal motility abnormalities, sclerodactyly and telangiectasia syndrome and mixed connective tissue disorders . Different detection methods are in use for the detection and monitoring for the autoimmune diseases and so many different types of techniques are also coming for example Cytometry and nanotechnology. 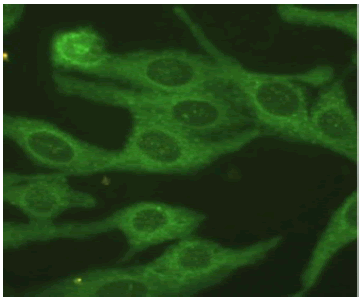 Indirect immunofluorescence test indirect fluorescence on Hep-2 (human epithelial cell tumor line) is a traditional technique for diagnosis of ANA and is considered as “gold standard” for testing for ANA in clinical practice with high sensitivity. 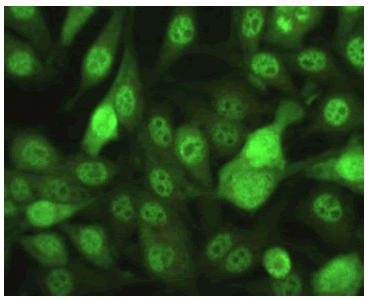 Positive fluorescence staining indicates the presence of ANA, but it does not allow accurate identification of these antibodies. Further some specialized techniques like Line Immuno Assay (LIA), western blotting or ELISA are employed for detection of specific antibody . In 1941, Klemperer, Pollack and Baehr first described systemic lupus erythematosus (SLE) as one of the CTD. Then in 1948 Malcom Hargrave, Helen Richmond and the medical resident Robert Morton noted the presence of previously unknown cells in the bone marrow of a patient with SLE. They called these LE cells and described them as “Mature Polymorphonuclear Leukocytes” which had phagocytosed the liberated nuclear material of another leukocyte. This extremely important discovery laid the foundation of research for ANA. Since then, ANA has been divided into specific subtypes based on the nuclear or cytoplasmic component they attack i.e. anti-DNA, anti-histone etc. 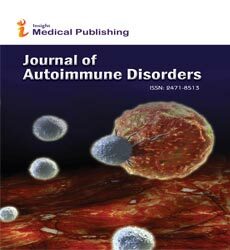 A review from Department of Nutritional Sciences, Pennsylvania State University, states that “Autoimmune diseases are characterized by the targeted destruction of self-tissue by the immune system. More than 80 known autoimmune disorders exist; as a whole, they represent a leading cause of death of young to middle-aged women in the United States today.” Despite their relatively high prevalence rate, the etiology and pathogenesis of most autoimmune disorders remain unknown, and cures remain elusive. To cure an autoimmune disorder, one would need to eradicate either the self-antigen or the immune cells responsible for the pathology. Eradication of the self-antigen is impossible; therefore, treatment options include various strategies aimed at regulating the autoimmune response. In addition, further investigation of susceptibility genes common to more than one autoimmune disorder, such as human leukocyte antigen, CTLA4, CD25, and PTPN22,34 as well as investigation of disease-specific genetic variations, will ultimately allow elucidation of the relative contributions of a host of genetic and environmental factors to the causation of these common disorders that frequently coexist . Materials required: Serum Sample, Cuvette, Petri Dishes, Pipettes, Centrifuge, Tweezers, Immunoflouresence Microscope, and Shaker. Reagents required: IMMUNO CONCEPT KITS for both IFA and LIA. Techniques used: Indirect Immunoflourescence Assay and Line Immuno Assay. Methodology: Collected blood sample were brought to the laboratory and serum was separated using the standard protocol of the laboratory. 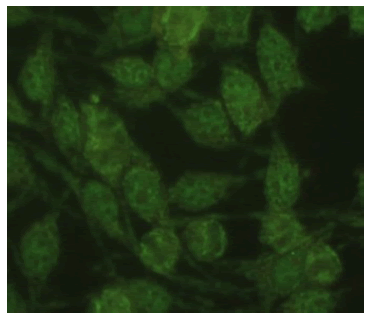 IFA was performed using Hep-2010 liver cell lines (Monkey) (antigen coated). Positive and Negative controls were run with each test daily. Serum was diluted in 1:80 ratio (serum:diluent) (10 μl serum +790 μl diluent). 25.5 μl of the diluted serum was then put on Hep-2010 wells. This was then incubated at room temperature for 30 min. This step allowed the antibodies in the serum to react with the antigens coated on the wells. The slide (wells) was then washed carefully and then dipped into the PBS for 10 min to remove the unbound antibodies. 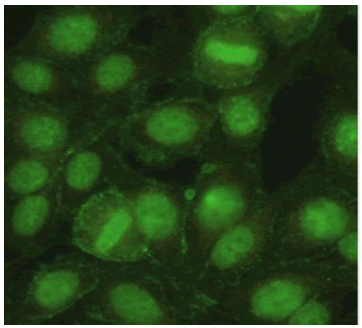 In the next step, FITC conjugate (Anti-human IgG conjugated to fluorescein isothiocyanate (FITC)) was added to wells, to get bound to the antibodies and emit fluorescence. The FITC was again washed off carefully and dipped in PBS (in dark) for 10 min, to remove the unbound conjugate bodies. The wells were then mounted using 0.09% NaN3 (mounting medium). The visualization of the slide was then done under the fluorescence microscope at 40X. Based on the fluorescent intensity, samples were graded (+, ++, +++) and NEGATIVE. 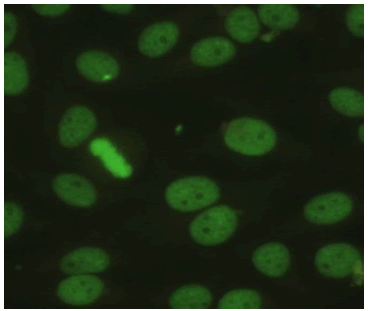 Negative: A serum was considered negative for antinuclear antibodies if nuclear staining was less than or equal to the negative control well with no clearly discernible pattern. The cytoplasm may demonstrate weak staining, with brighter staining of the non-chromosomal region of mitotic cells, but with no clearly discernible nuclear pattern. Positive: A serum was considered positive if the nucleus shows a clearly discernible pattern of staining in a majority of the interphase cells. 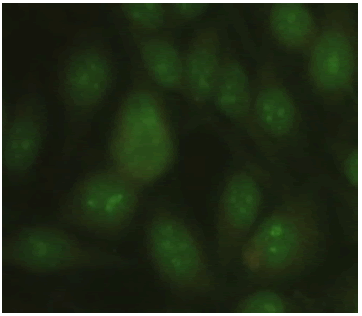 The positive sample showed bright applegreen fluorescence in the nuclei of the cells, with a clearly discernible pattern characteristic of the control serum that was used. Serum was diluted using DILUTION BUFFER in 1:110 and left on the horizontal shaker for 30 min. After this, 3 x washing was done with the WASH SOLUTION for 5 min each. This was then followed by adding CONJUGATE to the strip for 30 min. Again the washing step was repeated. To the washed strip, SUBSTRATE was added and left for 10 min. Afterwards, the reaction was stopped by adding STOP SOLUTION for 2 min. Then the strips were dried and evaluated by comparing with the intensity of Positive Control Line. A total of 715 samples were evaluated, out of which 306 were POSITIVE, while 409 were found NEGATIVE shown in Table 1 and Table 2. The patients found positive for ANA were contacted telephonically and the symptoms were found corresponding to the patterns shown in Table 3a and 3b. Table 1: Various patterns and their prevalence being out of the 306 positives. Table 2: Other combination-patterns identified in respective numbers. Table 3a: The patterns correlated with their respective antigens using Line Immuno Assay. Table 3b: Total coincidence rate, Positive coincidence rate and negative coincidence rate. ANA (IFA) is used for screening of patient with or without any clinical criterion for autoimmune disease in daily clinical practice. 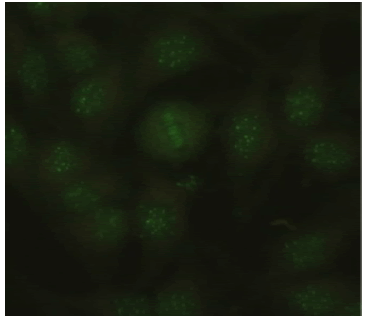 Its fluorescent pattern also could predict the presence of certain specific antibodies in the sera. Nowadays, the IFA has been replaced by newer technologies for the detection of ANA and several large laboratories switched to automated high throughput immunoassay platforms . However, in 2010, a paper published indicated that IIF on HEp-2 cells should remain the “gold standard” for detecting ANA, triggering a renaissance of the IFA ANA test . Detection of ANA by IFA may also yield false negative results even in the presence of high titers of antibodies, such as those directed to SS-A, Ro52, Jo-1 and others. Additionally, the challenge of significant variation of staining patters on the ANA HEp-2 IFA substrates obtained with slides from different manufactures has led to a proposed nomenclature for IFA pattern . A Line Immuno Assay is also performed for further confirmation and identification of particular antibody in the patient samples. A broad range of line immunoassays are available and they are typically used to confirm autoantibodies previously identified by ANA IFA or other screening immunoassays. According to some studies, despite of their easy use, line immunoassays have some drawbacks including lack of sensitivity and specificity for certain autoantibodies . Our study somehow, presents a contradiction and reflects a high positive coincidence percentage in accordance with ANA-IFA. However, line blot is comparable to ELISA in sensitivity and specificity and automated interpretation is also possible . To cure an autoimmune disorder, one would need to eradicate either the self-antigen or the immune cells responsible for the pathology. Eradication of the self-antigen is impossible; therefore, treatment options include various strategies aimed at regulating the autoimmune response. Hereby, we suggest a routine diagnosis of ANAs because autoimmunity has become a very common phenomenon in today’s sedentary lifestyle. This possibility could include the development and validation of disease specific screening assays on solid phase technologies. Cui Kong, Jianwei Zhou, Jinsong Sun, Aihua Shen, Qin Song, et al. (2014) Comparative Analysis of Antinuclear Antibody and Antinuclear Antibody Spectrum. American Laboratory. Gautam K (2015) Anti-Nuclear antibodies: Current concepts and future direction for diagnosing connective tissue disease. Journal of Pathology of Nepal 5. Kumar Y, Bhatia A, Minz RW (2009) Antinuclear antibodies and their detection methods in diagnosis of connective tissue diseases: a journey revisited. Diagn Pathol 4: 1. Sebastian W, Roy A, Kini U, Mullick S (2010) Correlation of antinuclear antibody immunofluorescence patterns with immune profile using line immunoassay in the Indian scenario. Ind J Pathol Microbiol 53: 427-432. P L Schwimmbeck, D T Yu, M B Oldstone (1987) Autoantibodies to HLA B27 in the sera of HLA B27 patients with ankylosing spondylitis and Reiter's syndrome. Molecular mimicry with Klebsiella pneumoniae as potential mechanism of autoimmune disease. J Exp Med 166: 173-181. Nossent H, Rekvig OP (2001) Antinuclear antibody screening in this new millennium: farewell to microscope? Scand J Rheumatol 30: 123-126. Meroni PL, Schur PH (2010) ANA screening: an old test with new recommendations. Ann Rheum Dis 69: 1420-1422. Wiik AS, Madsen H, Forslid J, Charles P, Meyrowitsch J (2010) Antinuclear antibodies: a contemporary nomenclature using HEp-2 cells. J Autoimmun 35: 276-290. Bordet C (2001) Performance of the Inno-lia ANA test in the detection of the main autoantibodies involved in connective tissue disease. Ann Biol Clin 59: 767-768. Damoiseaux J, Boesten K, Giesen J, Austen J, Tervaert JW (2005) Evaluation of a Novel line blot immunoassay for the detection of antibodies to extractable nuclear antigens. Ann N Y Acad Sci 1050: 340-347. Tan EM, Rodnan GP, Garcia I, Moroi Y, Fritzler MJ, et al. (1980) Diversity of Antinuclear Antibodies in Progressive Systemic Sclerosis. Arthritis Rheum 23: 617-625. Miyachi K, Fritzler MJ, Tan EM (1978) Autoantibody to a Nuclear Antigen in Proliferating Cells. J. Immuno 121: 2228-2234. McCarty GA, Barada FA, Snyderman R (1981) A New Autoantibody Staining Pattern, the Mitotic Spindle Apparatus: Immunologic Characteristics, Clinical Occurrence, and Cytoskeletal Studies. Arthritis Rheum. 24: S109. McCarty GA, Valencia DW, Fritzler MJ (1984) Antibody to Mitotic Spindle Apparatus: Immunologic Characteristics and Cytological Studies. J Rheum 11: 213-218.